Villa Boron is a bright and vibrant home, hugging the glittering ocean shore, offering a majestic, detached residence within perfect lawns with the beach just an amble away. 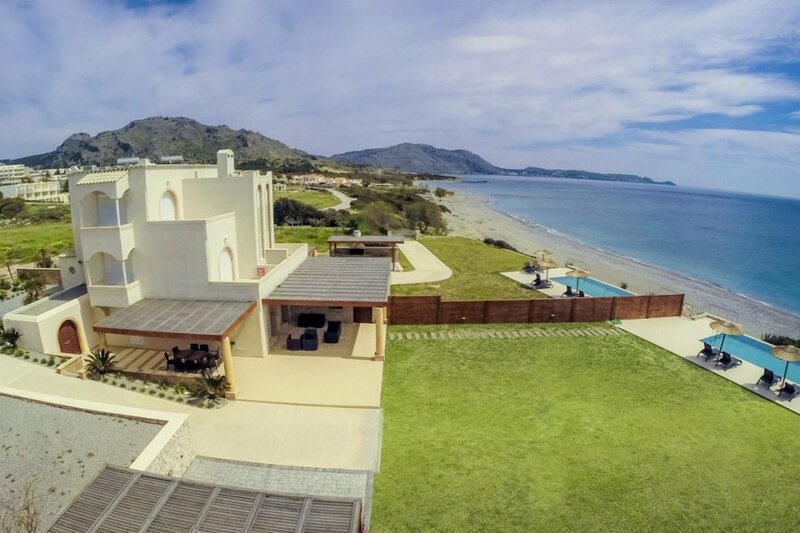 Villa Boron is a bright and vibrant home, hugging the glittering ocean shore, offering a majestic, detached residence within perfect lawns with the beach just an amble away! Sea lovers and water sports enthusiasts will be in paradise; this happy home offers a contemporary take on traditional architecture, framed by panoramic sea views. An impeccably maintained expansive lawn ends with a glistening infinity pool, surrounded by a sleek patio, parasols and indulgent loungers - with the never-ending skyline offering a fascinating sight in its ever-changing tones. This masterful home provides every little additional note of luxury imaginable: guests can rest assured that Villa Boron has it covered. For a day at the beach, there are beach chairs, while massage can be arranged back at the villa, or a sumptuous catered meal by a private chef or chauffeur driven tailored excursions. This sumptuous home blends the best of hotel grade services along with seclusion and a prestigiously executed independent home. Seven guests can be accommodated across three bedrooms and four bathrooms within decadently proportioned architecture; when alight at night the pool and house are a magical sight, while a curved stone path and flight of stairs leads down to the beach. Abundant with contemporary charm and charisma, this home offers a minimal and slick vibe with uncluttered spaces, sweeping open lawns overlooking open rural plains. The interiors are fresh, airy and modern with characterful touches. A vibrant open plan living space offers stylish entertainment space with accents of crimson red contrasting with the fresh neutral palette, and floor-to-ceiling glass providing a natural blend between indoors and outdoors. The contemporary kitchen, designer lighting and pared town tone of this understated home are entirely in harmony with the open, breezy environment. Each of the four bedrooms offers stylish comfort within pared back striking simplicity - a muted palette with accents of vivid colour, immaculately executed and quiet rooms with fantastic sea views. The fourth bedroom deserves a special mention for its lofty position at the top of the house, its unparalleled views and sublime comfort! Villa Boron is impeccably equipped, offering an outdoor dining space, shaded veranda, pool table, ping pong and DVD player - the whole family's entertainment needs will be met! Villa Boron offers the final word in contemporary, minimal chic living and beach front relaxed holiday style, enjoying the best of extra luxury services as well as the pure tranquillity of a private home! Villa Boron is nestled in a stunning beachside spot between Kiotari and Lindos on the south-east coast of Rhodes. Kiotari is a small, relaxed place on the coast offering a vast stretch of four kilometres worth of beach with everything from paragliding to pedalos on offer. Whether it be watersports or visiting the islands, there are Medieval castle ruins, Byzantine churches and a folklore museum at the lovely Asklipion. Gennadi is a bright myriad of whitewashed houses and narrow alleyways. The local market in Lindos offers fresh vegetables and fish; the idea for picking up some tasty local delicacies or freshly caught fish for the barbecue. The Acropolis, which Lindos is famous for, is one of Rhodes' must-see sights. Whether it be walking to the top, or traditionally going by donkey, it is a beautiful ascent ending in the ancient fortress, thirteenth century Greek Orthodox church and Roman temple. Kiotari has a sprinkling of supermarkets where you can stock up on local honey, olive oil and wine, whereas Lindos where offers interesting winding streets with everything from jewellery to pottery. From the villa itself, nearby, guests can access tennis courts, golf, boat and bicycle hire. Rhodes offers something for everyone: dense forest mountains, long and sandy beaches, almost year-round sunshine and one of Europe's most beautiful medieval towns; the walled Old Town of Rhodes has Unesco World Heritage Status with its sandstone architecture with minarets and cobbled streets.